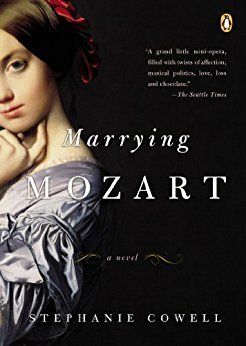 Marrying Mozart by Stephanie Cowell tells the story of young Mozart’s relationships with the four Weber sisters beginning in 1777 Manheim, Germany. The Weber family follows the patriarch’s direction in the appreciation of and vocation in music. They host musical nights every Thursday at their home, and it is on such a night that the family meets young Wolfgang Amadeus Mozart. The book shifts its concentration first to Josefa, the eldest, then to Aloysia (the one who broke Mozart’s heart,) to Sophie (the youngest and pious one,) and finally to Constanze (who eventually became Mozart’s wife.) Marrying Mozart is very much about how the Weber sisters interact with one another, how they come of age, and how society dictates their hopes and dreams and futures (often squashed.) Their mother’s story is also compelling in that her controlling behavior toward her daughters stems from an incident when she herself was a girl. I must admit that I did not know about the Weber sisters, nor their close involvement with Mozart, but I found this book to be enlightening. It was a tad too fast-paced for me in some parts, however, as there would be large time jumps over certain events I would have liked to have read played out in full. At the same time, I understand that this method is merely Stephanie Cowell’s tight prose style. PS now I want to watch Interlude in Prague!